“All Canadian aid for Tsunami relief would be channelled through our own organisations and equitable distribution is the bottom line of our humanitarian aid for relief, rehabilitation and reconstruction” said Hon. Jim Karygiannis, P.C., M.P., and Parliamentary Secretary to the Minister of Transport in a meeting with the head of the Political Division Mr. S.P.Thamilchelvan, LTTE's peace secretariat reported. 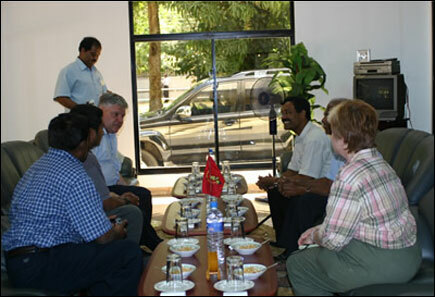 The Canadian MP arrived in Kilinochchi after an extensive tour of the Jaffna peninsula. He commended the well-coordinated services of the TRO in the aftermath of the tidal wave and assured that Canada would facilitate migration of affected individuals in the Tsunami hit areas, whose immediate relatives are domiciled in Canada, according to the website. “Mr. S.P.Thamilchelvan earnestly requested him to convey the desire of the Tamil people to the Canadian Prime Minister, to include the North coast locations, Mullaittivu and Vadamaradchy East in his itinerary. He also pointed out the special significance of the Canadian Head of State’s visit to the Tamil habitats vis-à-vis the sentiments of the Tamil people provided asylum in Canada with respect and dignity,” the report further said.